Day 5, Holy Spirit: please remember that today is my birthday! Reading for Day 5: Holy Spirit - please remember that today is my birthday! Holy Spirit, please remember today it's my birthday! As I writing this I am aware it's the month of August and today it's my birthday. Glory Be to God! It's very early in the morning, to be precise 1-05 am. On my birthday I go into a quiet reflection, for it's a day to analyse, reflect and ponder! 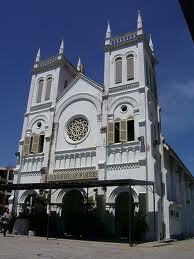 The above picture is of the Church where my dear Mum and I attended daily services, at Our Lady of Lourdes Klang: No. 114, Jalan Tengku Kelana, 41000, Klang, Selangor, Malaysia. I received much spiritual nurturing within this premises. Our whole family worshipped there on Sunday mornings. Mum ingrained in me to attend daily Mass, which I believe started at an early age of seven. I was a daily communicant, attended Saturday Novenas, and also Stations of the Cross. There was also a grotto at the Klang Church that resembled Our Lady of Lourdes Grotto in France which is located on the south-western part of the Hautes-Pyrenees. Years later read what happened to me when I was sitting quietly at a church in London, England: St James the Great Church, Peckham Rye, London. News of heaven’s visitation has come following the miraculous imprinting of the image of the Virgin Mary on a window plane in Subang Jaya, Kuala Lumpur. It appeared on 11th November, 2012. This image has now found a permanent home at the back of Our Lady of Lourdes Klang. This happens to be my former kindergarten which I attended. It has now become a chapel for the image of our Lady of Subang Jaya to rest in and for the world to view. View this below video of Heaven's visitation I received when I spent a whole night prayer intercessory vigil at Our Lady of Lourdes grotto in France. You need to view to catch the vision. It all came to pass on 23rd April 1983. It's a fascinating view. The faith was rooted and grounded by my dear mum in Malaysia. I was brought up as a devout and faithful Roman Catholic. As a young child I attended Mass at 6 am on a consistent basis. Even till today I can still remember the church bells at the Marian Church of Our Lady of Lourdes Klang chiming loudly.I was so concerned that the bells were disturbing people from sleeping, but for me the bells were informing me that Mass was about to commence. Praying on my knees became a habitual pattern. I developed a relationship with my Heavenly Father at a very young age. I remember an incident that happened to me when I was about 10 to 11 years old. About three to four horrible thieves tried to enter my Dad's bank on the ground floor, as a family we were living on the first floor. My mother woke us all up (this happened between 3-4 am) and we had to keep a watch from the window of the first floor. It was a terrifying experience, knowing there was some foul men right at the bottom of our window. It was such a shocking experience that we forgot the emergency police number, which is 999. The reason why my mother got up was, (which was an act of the Holy Ghost) my mother heard the flutter of our neighbours pigeon wings flying away. Obviously they were disturbed by some intruders. The final story to this was the thieves obviously knew we were up, so they made a grand escape out of the back door. The next day I was still shaken by this experience. I remember going to the local church and kneeling near the altar, and I was the only one in the church and telling my Heavenly Father that I will serve him for the rest of my life, provided he keeps all thieves and crooks out of our bank house. He was faithful for evermore. No one dared to enter our house! After I prayed and dedicated my prayer to our Lord a few incidents happened, here are a couple of stories. During the 1960's large amounts of cash were physically transferred by bank employees from one bank to another bank. For example one of our bank staff used to carry hordes of cash with him to purchase a bank draft from another bank. The other banks were usually British banks and they used to be referred to as the clearing banks. Nowadays banks use the facilities of armour plated security vans to transfer cash. On one occasion our bank clerk Lingam was transferring some cash when he was attacked. This time he was cycling to go to the branch of the Overseas Chinese bank. One must note here that all these bank branches were not too far away- by cycle it would just take 5 minutes. My Dad totally trusted all these bank clerks who were transferring the money. The robbers tried to rough up Lingam but he resisted with all his might and he was slightly injured. The robbers were concerned that Lingam was shouting too loudly and they ran away. I remember coming back from school and my Dad asked me to go to the Police station to see how badly injured Lingam was. When I arrived at the station I was taken into the office of the OCPD ( The Officer in Charge of the Police District) and in a thorough Malaysian lingo he asked me, "what la, your Dad should have employed an armed Security man to transfer hordes of cash around" I obligingly said, "yes,, he should have!" Sometimes some of these bank clerks were transferring money to different branches amounting as much as $30,000-00 a day. One of our clerks use to stash the cash in his underclothing- impenetrable for robbers to reach!!!! On another occasion a man came to our bank and he asked to see my Dad. Apparently my Dad knew this man as an acquaintance. He told my Dad that he had won a prize on his lottery ticket. This was during the days when you could go into a bank and redeem your winning price- sometimes this could be thousands and thousands of dollars. My Dad had a thorough look at the lottery ticket and he observed at once that the ticket was fraudulent. When the man found out that my Dad knew, he pleaded with my Dad not to call the Police, for he knew a prison term awaited him. My dad decided to show compassion to him and he destroyed the lottery ticket in his presence. He dumped it in the bin. My mother the intercessor who for all intents and purposes was to our family the unpaid 'assistant bank manager' advised my Dad to pick up the torn lottery ticket and tape it back with some sello tape. Thank God for mum. For the next day the same man came to the bank with a Police Officer and accused my Dad for knowingly destroying a genuine lottery ticket and depriving him of his winnings. My Dad instantly took out the fraudulent ticket and handed it to the policeman. The cheating man was so shocked to see my Dad producing this taped up ticket. The same Policeman took the fraud back to the police station for further questioning. Till to date I do not know what ever happened to the man. All I can say is my mum saved my dad from various untoward incidences. Watch the video below and prayerfully observe on how strong the impartation of the Holy Ghost is. Do check it out and see whether the sweet Presence of the Holy Ghost touches you! You can only know through viewing the video. It surely will, for moments of this nature are very rare. Do listen to the anointed hymn below- it will comfort and bring solace to your inner being. It's a promise. Go for it, put us to the test and view it! *Pada hari Sabtu 18 September 2010, kami menghadiri Doa Malam yang amat megharukan di Hyde Park, London, United Kingdom. Antara 8 pm dan 8-30 malam, senja berlabuh dan sebahagian besar dari 80.000 jemaah berkumpul berada di lutut mereka, kepala tertunduk dalam doa khusyuk di rumput di Hyde Park. Tekan butang di bawah ini untuk video YouTube dan rasa sendiri sambil mendoa betapa kuat impartasi dari Roh Kudus. Sila cuba dan lihat samada Kehadiran manis Roh Kudus menyentuh anda! Anda hanya boleh tahu bila melihat video ini. Kami amat gembira mendapat peluang menghadiri acara ini, dari jam 3 petanghingga 8-30 WIB. a) Ini himne Kristian, Lead Kindly Light juga kegemaran Mahatma (Mohandas Karamchand) Gandhi dan secara rutin dinyanyikan di pertemuan doa nya. Mr Gandhi mendesak dan menggalakkan ketidak kerasan dan pembangkangan awam sebagai sarana untuk mencapai kemerdekaan India. We want to acknowledge our Lord's blessings on this website. It was blessed and inaugurated officially on 1 August 2002. The counter below was introduced for the first time on 8th January 2014. Sadly the firm who installed my previous beautiful counter many years ago,and filled it with exciting statistics,suddenly went out of business.As a result we lost all our treasured statistics. We like national flags portraying on our website so we are re-introducing the flag counter freshly again through another firm.It is so exciting to see visitors coming from the far corners of the earth!